Our zesty Beef ‘n Bean Chili. Sam’s recipe from Taos, New Mexico. Made with Pork and Green Chilies. Freshly made in Sam’s Kitchen everyday. Call us for today’s offering at 508-771-8816. Two of our homemade soups are always offered on our “ALL YOU CAN EAT” Chili, Soup, Salad and Taco Bar, Monday through Friday 11:30 AM to 3 PM. A layered “Chip Dipper” of Refried Beans, seasoned Ground Beef, Chile con Queso and melted Cheeses. 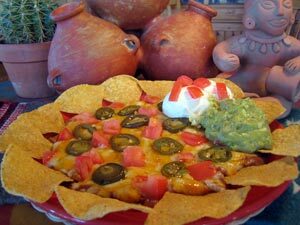 Topped with Pico de Gallo and a dollop of Sour Cream, then rimmed with Tortilla Chips. Homemade. Use your Tortilla Chips for dippin’. Created by Uncle Emilio and his Cousin Tonio. Sprinkled with Southwestern Seasoning and served with Marinara Sauce for dunkin’. A zippy, cheesy ‘n creamy Chili c on Queso made with Jack, Cheddar and Cream Cheeses blended with Jalapeno ‘n Chipotle Chilies; topped with a “dollop” of Pico de Gallo. Served with our “fresh Fried Daily” Corn Tortilla Chips. Roasted with Sam’s Original Habanero Chile Marinade. Served with Ranch Dressing. 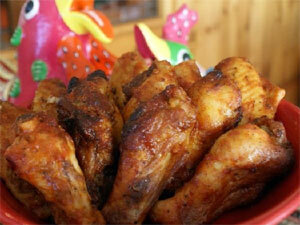 A great combo of BBQ Baby Back Ribs and Habanero Chicken Wings; served with “cool” ranch dressing. Red Jalapeno Peppers stuffed with Cream Cheese then deep-fried in a spicy, crunchy coating. Chipotle Sour Cream for dippin’. Spicy deep-fried Chicken Tenders served “Buffalo-style” with Bleu Cheese Dressing and Celery Sticks. A “Kickin’ Combo” of zesty flavors. 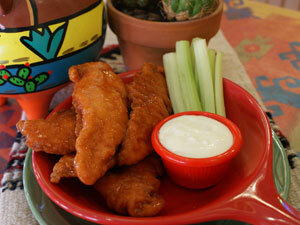 Boneless Buffalo Chicken Tenders and Red Jalapeno Poppers served with Bleu Cheese Dressing and Chipotle Sour Cream. Our own classic version. Monterey Jack ‘n Cheddar Cheeses baked over a thin layer of Refried Beans topped with diced Tomatoes and sliced Jalapenos. Rimmed with Tortilla Chips. Guacamole and Sour Cream makes Sam’s Classic version “El Supremo”. With Pulled Chicken, Guacamole and Sour Cream. Mild and simple. A fried Flour Tortilla covered with melted Monterey Jack ‘n Cheddar cheeses. 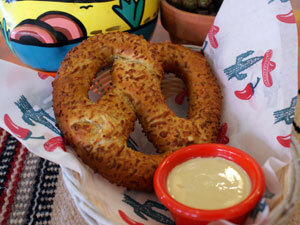 A “zippy” JUMBO Jalapeno Dough Pretzel stuffed with Pepper Jack Cheese and baked to order. Served warm with a “cool” Dijon dippin’ sauce.